Sometimes it amazes me to think about how pieces of the past are strung together. When things come full circle and I realize how they are connected, it blows my mind. I guess that’s a pretty typical reaction and I’m not trying to get super deep and philosophical here, but I’ve been thinking about these connections while working on my most recent mini-series. Typically I work on wood, paper or canvas, but recently I have been using book covers. The subjects are mostly normal, everyday objects and some are even life-size. 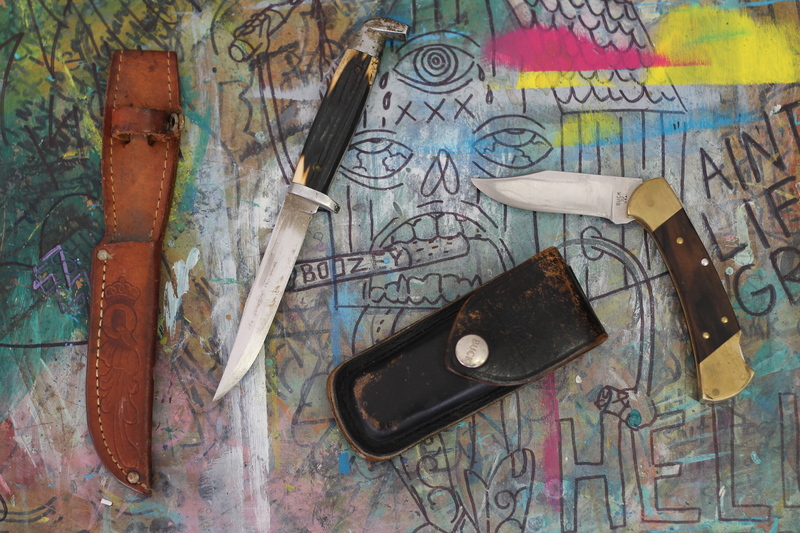 The series began because I wanted to paint a knife that was passed down to me by my father. This past summer, my dad gave me several old knives of his that I love because they look well used and (buzzword) vintage. I can remember these knives growing up. They were kept in his toolbox in the basement with some of his other hunting gear. Now they hold a sentimental value to me and I treasure them as more than just a tool. Fast-forward from my childhood to my college years at James Madison University. The majority of my studio classes were in an old building far from campus that was converted into classrooms. Everywhere you turned, you could find inspiration – the professors oozed it, walls were splattered with it, and at any given time you could find other students creating. It was my personal heaven and to this day I miss that type of environment and the fuel it provided. One of my favorite hangouts was in the sculpture wing. The time spent hanging out with the professor, grad students, and undergrads that were majoring in sculpture had a profound impact on my art understanding and aesthetic. There was one girl in particular named Julia Murray who worked with old books. She frequented the local thrift store as we all did and would purchase hardbound books for a quarter. I remember going to her show at the Zirkle House (a local JMU art venue that has now been demolished) and there were books as sculptural forms everywhere. Pages hung from the ceiling, books were stacked in corners to make shrine-like forms, some looked like they had been destroyed by a dull blade. I remember thinking to myself that this is a game changer and I started looking at everyday objects differently. After college, I started teaching art in a middle school. Our library turned out to be a super resource for a multitude of reasons. For one, the librarian was the coolest and most helpful librarian I have ever met. Second, the library was home to a Mac lab with giant TV-sized monitors, and third, of course there were books and magazines everywhere. As a way to make room for new materials, old books and those that hadn’t been used or checked out in forever were discarded. I would usually wait for the other teachers to browse and take what they wanted and then I would take everything that I could use. I had students do sculptural projects similar to Julia’s and use the pages for paintings and collages. When they were finished, all that was left were the covers. Like a good art teacher, I didn’t let them go to waste. I saved them all and I am finally getting around to using them three years later. Not all of the paintings in this series are going to be knives. Some are character-based designs that I have done before and some are new altogether. It’s been cool working with these and it has honestly triggered a lot of really great memories. My favorite is when I find the old card indexes on the back cover that have the name of the school where I taught.